Forty-two pounds of polished granite slid down the sheet of ice with the sole purpose of landing on the button. Brooms and sweepers kept the stone on course, by might or sheer force of will, helping shift the stone’s orientation to meet the desired end. It seemed an impossible task, all without actually touching the stone. How could all of this frenetic activity affect any change in course? I’d never seen anything quite like curling. It was springtime in Boston in the early 1980s, with all of the quintessential elements that only New England can deliver at that time of year. My studies at Boston University nearly over, I was now on my third internship, this one at a large advertising and public relations agency in the city. As my services were expendable, I ended up working on pro bono accounts or the offbeat request that none of the seasoned account executives wanted. This suited me just fine. Who knew that the Regina Maris, a 1908 three-masted topsail schooner, could be turned into a floating marine research school to study humpback whales? I managed to get Geraldo Rivera to film a segment of his news magazine show on board the ship on the Fourth of July. CBS journalist and anchor Charles Kuralt also covered the ship school on his Sunday Morning news show. These were silent victories. The busy agency didn’t take much notice and my peers didn’t much care. But I learned that magical things can happen when you just go for it. Next on my borrowed desk, the task of getting publicity for the US Men’s Curling Championship and its upcoming bonspiels at The Country Club in Brookline. I mailed my press releases with live stamps in that pre-email dark age, then diligently followed up with phone calls. Much to my surprise, then Boston Globe reporter Steve Marantz took my pitch. Instead of just accepting the idea and covering the story, he graciously asked if I’d like to join him. Inside the brisk ice rink at the club, I watched Marantz work the room. It was as if he’d been writing about curling for years, which amazed me since curling seemed like the most interesting sport that you’d never heard of. 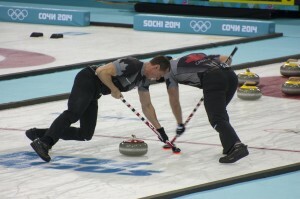 Curling relies less on athletics than a sharp mind, the ability to vocally project directives to teammates, and being seriously skilled with a broom – all in the service of sliding stones slowly. It’s perfect. As an intern, it was an exciting day. I was introduced to a “game of skill and social grace,” and I’d gotten a backstage pass to a day in the life of a working journalist. Although the topic of sports is not usually my thing, it underscores all the more why an unlikely wayshower had such an impact. Sparing me the wait for the “T” (Boston’s subway), Marantz drove me home after the spiels. Along the way, he asked questions that got me thinking differently about my future. Walking up the steps to my brownstone on Comm Ave., I held a small enamel pin with a squirrel atop a rolling green and yellow ribbon, the symbol of the club. Over the years, that pin has jumbled around in a box like a good penny that keeps showing up. Considering his most recent book, Next Up at Fenway: A Story of High School, Hope and Lindos Sueños, I suspect that Marantz has a tendency to see potential in others. The kindness he shared, and seeing something beyond the surface, inspired me to believe there would be more on the horizon than writing press releases and ordering balloons printed with bank logos. I caught a glimpse of being open to something new. Taking risks and stepping beyond our comfort zone often shows us the way. 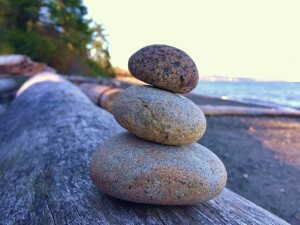 And while the granite stone knows not its final destination, the effort of guiding it there is a beautiful thing.